~ Lexie Conyngham ~: Literary house for June - or dwelling place, anyway! Literary house for June - or dwelling place, anyway! Here’s another book I read again and again as a child, and the images are vivid in my mind. The Little White Horse by Elizabeth Goudge was published in 1946 but is set fifty years before that at least. Maria, an independently-minded (and occasionally almost stroppy) Victorian child, has been brought to live with a distant relative in a hidden valley, where she finds she has a great deal in common with others who lived there long ago. Loveday is a mysterious lady but quite enchanting, and it was a revelation to Maria to be shown her house. When the door was shut it was pitch dark, but with her hand held firmly in Loveday’s warm strong clasp Maria felt no fear. They walked together down a narrow tunnel, and then Loveday lifted a latch and opened a door, and a lovely green light, the sort of light that Maria imagined lit the world beneath the sea, flowed over them. ‘This is my living room,’ said Loveday. 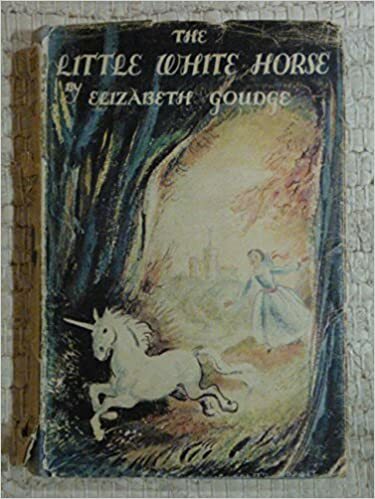 Elizabeth Goudge wrote some fine adult books as well - The Dean's Watch is one of my favourites - but I’m afraid I can trace my love of geraniums, salmon, pink, red or white, to The Little White Horse!